2010 has been the most amazing year. I can’t think of any other year in my life where I’ve had so much excitement and surprise and frustration and expectation and anxiety and stress and giddy happiness. This is the year when my little shop-within-a-shop went out on its own; when I saw my name on the cover of a book that I wrote; when I brought my fourth baby into the world; when I tried (unsuccessfully) to sell my house while dreaming of another one; when I dipped my toes in the waters of pattern design; and when I ventured into teaching sewing online. It’s been WILD and amazing, and it has been one other thing: a TON of work. These last two weeks have been a vacation for me: I’ve been writing here on the blog, but mostly sticking close to home outside of that. No classes during the holiday party season, lots of down time with the kids. And it has confirmed what I already suspected: my work is better and more fun when I pace myself. I feel almost embarrassed to have realized this so late, when I’m pretty sure most of you could have told me that ages ago, but I never said I liked to do things the easy way, so here I am. I have SO MANY cool plans, things I really want to do, things I’m excited to do and have been looking forward to for ages. And I have some other ideas that I like, but that I’ve been motivated to do because I wanted to be the first one to do them, even if it meant that I didn’t do them to the best of my ability or that I rushed a bit. I have lists and charts and diagrams and notebooks filled with jots and sketches and bullet points, all waiting for their turn. Looking over those, my epiphany has rung true again and again: sometimes, less really is more. Sometimes, a single job well done is worth a dozen jobs done just pretty well. I’d like for 2011 to be my year of Well Done, with the expectation that the ideas I have now won’t be the only ideas I ever have, and that as the years move along I’ll have other opportunities. Without getting too squicky-touchy-feely, I’ve realized that I said “yes” to a bunch of stuff in 2010 because I was afraid if I said “no” that I’d miss out and never have the chance again–and I’m pretty sure that’s not the case, or that if it is, I wouldn’t miss out on anything worth doing, anyway. Because, really. My life is already so much more than I could have hoped, and every bit that I add to it is so much gravy. Let’s not be greedy with the gravy, know what I’m sayin? So in 2011, I’m cutting back a bit. I’ve organized my ideas into five families, and I’ve decided to stick to those and really give them my attention and see where they take me–I don’t want to run the risk of spreading myself thin and missing out on something really cool because I tried to do too much at once. I’m kinda excited, actually, looking at these five big ideas, and seeing how they’re going to play out. It’s always a gamble, you know, making a Plan and having Goals. You never really know how it’s going to work out, or if you’ll look back later and feel like a dork for having thought it would work out the way you hoped. I’ve had my share of disappointments and unexpected surprises in 2010, and wouldn’t really like to repeat them. But I like going into things with the Plan at my side, as long as I know ahead of time that it’s totally OK to blow off the plan when the lemons start rolling in. I like challenging myself to lay my hopes out on the table, and this year, I’m prioritizing my hopes and my dreams, and giving my best to the ones that really make me feel all tingly and happy inside. In no particular order, then, my Five Blog Projects for 2011. I’ve seen plenty of books out there about sewing for children, some of them so wonderfully inspiring that I can hardly stop myself from trying to reach through the screen to get them from Amazon so I can have them right. this. minute. But I don’t often see many books about sewing WITH kids, about teaching our children how to sew because we love it and we think they’ll love it and because it’s a really cool thing to do together. I’m really excited about this one, and am already experimenting on our own children working with our kids on some cool projects. I think especially with so many of us who have small children at home and love to sew, it can be really tough to be good at both, and I love the idea of developing projects and tutorials and rounding up goodies from the internet that we can use with our kids to share with them something they can take with them forever. This is planned as a Thursday feature starting in January. I have actual sketches of the plans I have for my fantasy home–like, with paint chips and with furniture (that I don’t own) all arranged, with plans for the wall art, for goodness sake. It takes a lot of time to sketch out a fantasy house, let me tell you. And getting it to scale? Seriously. And yet, if I gave half that time to the house where I actually live, maybe I wouldn’t want to move quite so badly (or ironically, maybe this house would sell faster). I know I’m not the only one who could stand to turn the energy invested in lottery dreams into energy doing for the home we have now–and learn to like our own surroundings a little more. From finally slip covering those chairs to painting the laundry room where I spend far too much of my time to making a dust cover for my sewing machine at long last, I’ve got a list of tasks to do for my home this year. This is an occasional series, popping up as I get projects done, on no particular schedule. I’m calling it Neat as Ninepence, in hopes that my home will indeed be neat and tidy and just as I imagine it in my head this time next year. This one is actually the first in a series of new online sewing classes I’m working on, and I’m super excited. It’s based on Stitch by Stitch, and is five weeks of beginner sewing taught via video, audio, interview, and photos. If you’ve been wanting to hone your sewing skills, I think this is a fabulous class to take from the comfort of your own home, and I’ve been wanting to teach it for a very, very long time. The projects are really cool, the videos are pretty funny (if I do say so, and I do), and the pace is perfect for learning or re-learning foundational sewing skills. I’ll offer it right at the beginning of the year, when your schedule has settled down a bit and you can dig in and roll around in some sewing goodness. The e-courses page is the best place to look for details and the registration button, as well as titles of the other online classes I have planned for the first part of 2011! Woot! 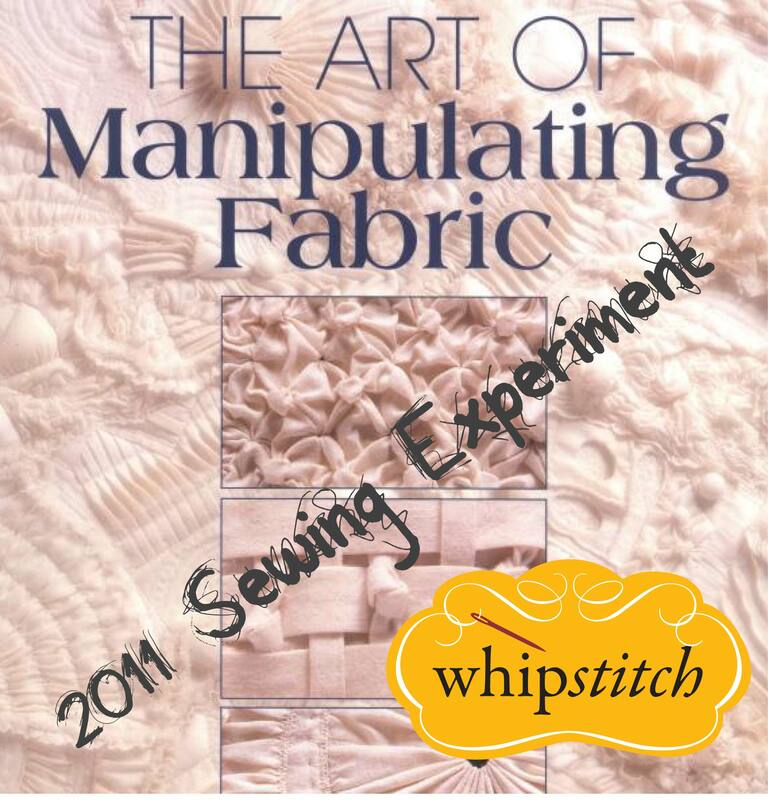 One of my favorite books to flip through is The Art of Manipulating Fabric by Colette Wolff. According to my editor, it’s also a consistent best-seller, with no flash or fury, just great photos, careful instruction and a huge range of ways to create three-dimensionality from fabric. I’ve wanted to do some projects based on her techniques for a while, but could never decide where to start. So I think I’ll start at the beginning and work my way through. I’m planning individual projects for each of the techniques, so that I won’t just be making samples but will really be putting her instructions to use on a finished piece. I’m hoping it will encourage me to do a LOT more sewing for myself this year, and am already feeling the tingle of anticipation and challenge. This will start next week, and show up weekly-ish as I work my way through the techniques. The Sewing Buddy Project was SO MUCH FUN in 2010. I’ve been getting emails and notes about it ever since we closed the registration last year, and I am so excited to see it go back into action in January. I was bummed to hear that a few of the Buddies disappeared after joining, but just this morning heard some of the coolest success stories–bestest sewing friends across the pond! learning new skills from someone in another state! Flickr groups just for the two of you!–that I am really revved up to see some new ideas this year. I’m thinking contests, check-ins, and fun activities galore! Oh, and no reason to ditch your 2010 Sewing Buddy–just add a new one in 2011 and expand your personal sewing circle! Sewing Buddy posts will be every three or four weeks in 2011, depending on how many Buddies there are to corral. Will these five be the only things I blog about in 2011? Golly, I hope not. But I’ve opted to let myself off the hook from developing ninety-six thousand different posts, and am pouring my energy into these ideas to see what really cool stuff will come of it. I’m kinda curious to see where it all goes. Could be awesome, could bomb spectacularly. Either way, it’s looking like a ton of fun already. Whaaaaat? You know that’s right. I am SO HAPPY you are doing Sewing Buddies again. After connecting with mine I did a lot of legwork, setting up a blog for us, designing headers, etc. I then suggested we swap fabric and create fun items from our surprise bundle. She loved that idea. I sent her the fabric she requested and that’s when she BAILED! I was really really sad about it. Hoping my next assigned sewing buddy is not quite so flaky! I think these are all good goals. I’m kind of in the same boat – taking on fewer projects to really enjoy the ones I do take on. Definitely excited about sewing buddies again – my buddy disappeared after the first email exchange, so hopefully my 2011 buddy will stick around! I had some really fun ideas to share with my buddy that have been tucked away for the next one. Oh, I am intrigued by the sewing WITH children idea. I have also wondered why more books haven’t been published on the subject. It must for legal reasons. The sewing Buddy thing sounds fun and I will look in to it when it’s posted. Just not sure of the details and time involved. Thanks for posting. I can’t wait to see what you’ve got planned for Sewing with Kids! My nearly four year old daughter loves to sew with me! I hope you will open Sewing Buddies registration for 2011. I would LOVE to participate. I wouldn’t bail on you Emilie! I promise…LOL! It’s quite the ambitious year you have set out for yourself Miss D and I can’t wait to see how it all turns out. Happy New Year!! You had a rocking year girl so you should be pooped. Kudos to you for all you accomplished in 2010. My sewing buddy and I had a great time corresponding back and forth and sharing our favorite on-line sewing tutorials, so thanks for initiating this. I too love the idea of sewing with kids. My daughter is interested and I am not sure where to begin. I had a great time making bias tape with you this week – thanks for the one on one teaching time. I love your shop! Peace and have another stellar year. Great post, Deborah. Every year I do a reflection post on the current year and a goal setting post for the new year. Whipstitch was a big part of my 2010 (see here — I give you a shout out –http://www.graysonstudios.com/blog/2010/12/31/2010-in-review-still-feelin-gooooooood/). 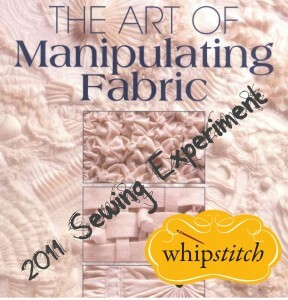 Looking forward to participating in new classes and events at Whipstitch in 2011. I especially hope to have a sewing buddy this time around since I was one of those folks who got dumped by my buddy last year, LOL. Happy New Year!! I’m very excited about sewing with kids. Ready to teach my 4-year-old granddaughter–I already bought her a Featherweight! I love the idea of sewing with kids. I learned how to sew from my mom at age six. For my daughters sixth birthday my mom got her a sewing machine to carry on the tradition. I just wish I had half the patience my mom did for teaching me to sew. I am struggling with the “teaching”. I tend to take over and do the sewing. I’m all for focusing on specific goals and projects… if more is done or offshoots come from it – that’s great! But at least your got the core focus there to guide you along the way…I’m definitely looking forward to your posts and appreciate all the information you share! Thanks! Sewing with kids: YES! Some of my fondest memories I have of my Grandmother were of her teaching me how to embroider. I like to think the time she spent teaching me led me to be the sewing addict I am today!